Nanophotonics has emerged rapidly into technological mainstream with the advent and maturity of nanotechnology available in photonics and enabled many new exciting applications in the area of biomedical science and engineering that were unimagined even a few years ago with conventional photonic engineering techniques. 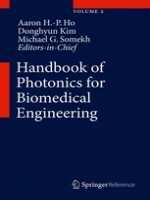 Handbook of Nanophotonics in Biomedical Engineering is intended to be a reliable resource to a wealth of information on nanophotonics that can inspire readers by detailing emerging and established possibilities of nanophotonics in biomedical science and engineering applications. This comprehensive reference presents not only the basics of nanophotonics but also explores recent experimental and clinical methods used in biomedical and bioengineering research. Each peer-reviewed chapter of this book discusses fundamental aspects and materials/fabrication issues of nanophotonics, as well as applications in interfaces, cell, tissue, animal studies, and clinical engineering. The organization provides quick access to current issues and trends of nanophotonic applications in biomedical engineering. All students and professionals in applied sciences, materials, biomedical engineering, and medical and healthcare industry will find this essential reference book highly useful.